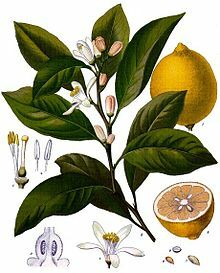 The lemon is a small tree (Citrus limon) that is green even in the winter. It came from Asia, and is also the name of the tree's oval-shaped yellow fruit. The fruit is used for cooking and other things in the world – usually for its juice. People do not know for sure where lemons have come from. However, most people think that lemons first grew in India, northern Burma, and China. The lemon is the common name for Citrus limon. A lemon is a yellow citrus fruit. It is related to the orange. Lemon juice is about 5% citric acid, and has a pH of 2 to 3. Lemon plants vary in size yet stay generally small. The tallest height they can get is about 6 meters tall. Lemons taste sour. The juice, zest, and pulp are often used in cooking, often on fish and other meat for better taste. Lemon is also used to flavour drinks, such as lemonade or soft drinks. This page was last changed on 27 January 2018, at 07:55.